For the ‘Theory of Evolution’ Johan Thom created a multilayered artwork comprised of animation and film sequences projected over a live performance. This performance was then re-filmed and presented as a final artwork in DVD format. In the work Thom confronts us with a narrative loosely structured around the search for human progress and perfection during the twentieth century. Thom appears dressed in white, with yellow rulers extending from both his hands and feet. Like a virus, he then inserts himself into this narrative of simultaneous progress and destruction. 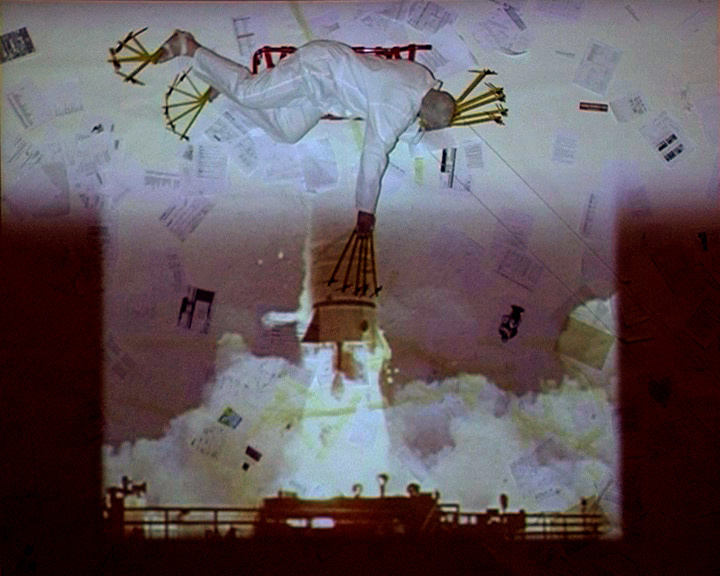 For example, in a series of shots depicting the disastrous failure of the US government to launch its first space rockets into orbit, Thom suddenly appears floating directly above the launch pad, destroying the rockets by punching, kicking or even scratching them. In other sequences he appears to be flying above the urban landscape of contemporary Johannesburg, or joining a procession of marching rulers, and even magically raising the dead from a post-apocalyptic field of skulls and bones. Nonetheless the consequences of his actions are both humorous and tragic: his mischief is that of a court jester who playfully reminds humanity of its shortcomings, failures, illusions of grandeur and frailty. Throughout the work the values of chaos and order are constantly juxtaposed and ultimately conflated. The rulers extending from Thom’s hands and re-appearing sporadically as animation elements, as with the image of Sir Francis Galton (the father of the science of modern Eugenics) and the numerous skulls and skeletons, remind of the scientific search for order and structure. Conversely, numerous images of explosions, vehicle collisions and even outrageous human tricks represent chaos and disruption. However, the free interaction of Thoms body unite all these elements into a single, sometimes volatile, sometimes harmonious, whole. 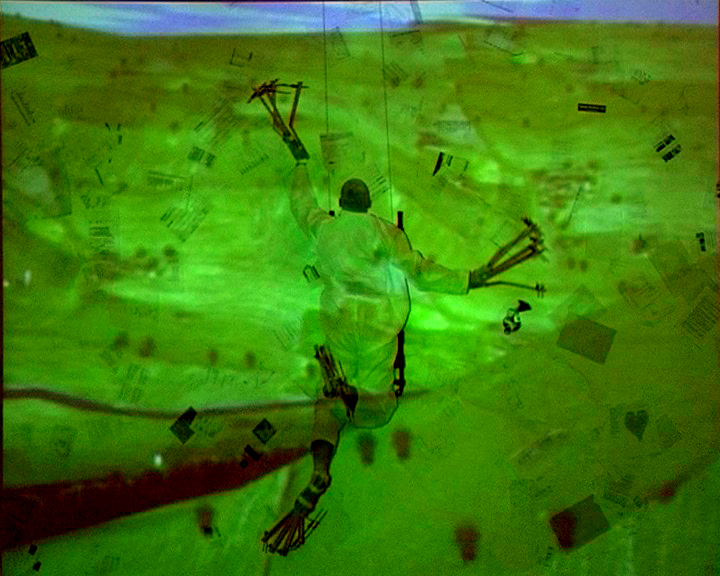 The work was exhibited on a television wall consisting of 9 screens. 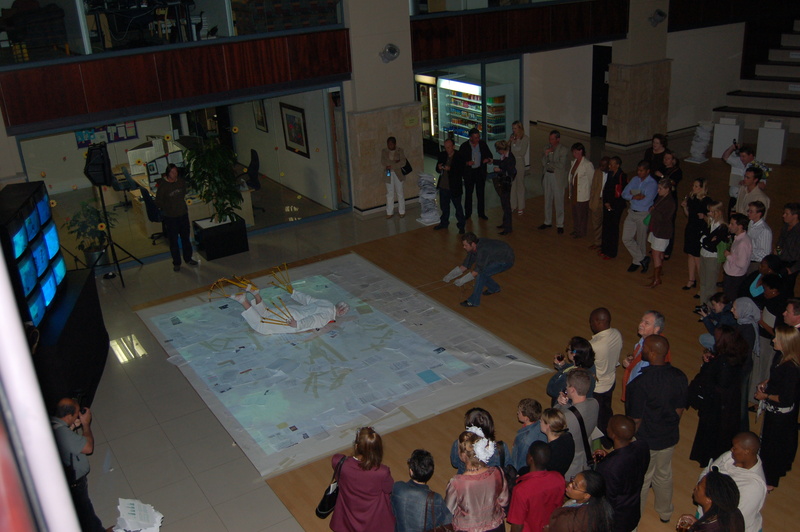 The “Theory of Evolution” was commissioned by Coeo, as part of the ‘Waste at Work’ 2006 initiative. Hollard Insurance provided logistical support as well as the venue for the film shoot at its headquarters in Johannesburg.